Today's post is a long one but a fun one! 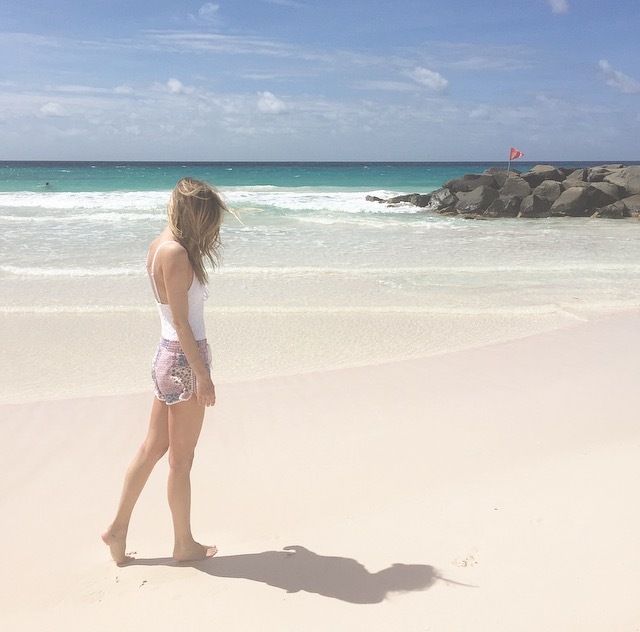 I'm rounding up a bunch of my day & night outfits from Barbados plus sharing some details about our trip, including where we stayed, what we did & what we ate! To start, let's check out my clothes & accessories!! 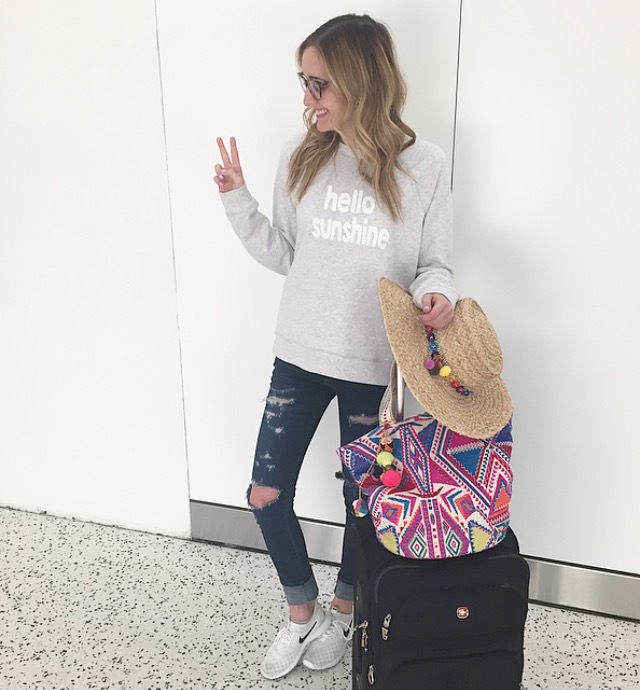 How cute is this sweatshirt? I wore it on our flights to & from Barbados and plan to wear it with denim shorts out East all summer long! White is my favorite color when it comes to swimwear. It instantly brightens you up & makes your skin look more tan! You can't tell in this photo, but this suit is lace! You saw these sets in Thursday's post but I couldn't resist including them again. Clearly I'm obsessed but can you blame me?? Loving one piece styles right now. These two have a high cut on the legs making your legs look miles long! Plus, they are under $50! Have you noticed a trend in our looks yet? I told you we loved to match/coordinate! These sandals are going to become my new favorites this summer. Classic color & style & SO comfy! Star prints are everywhere lately! I love this unique print, especially in a subtle way like on these denim shorts! They were so cute for the beach! Now onto our travel details...My family likes to take one trip a year to a tropical place to relax and spend time together without any distractions. Last year, we headed to the Hilton in Barbados & we loved it so much that we headed back to the same location this year! This is something we had NEVER done in all our years of traveling! I like the excitement of visiting somewhere brand new, but it was cool to visit a place a second time since we were familiar with the ins & outs of the hotel & area this time around! As I mentioned, for the second year in a row, we stayed at the Hilton in Barbados. The hotel is really nice & is the perfect place to stay for a relaxing vacation. The resort has multiple pools plus beach access! Even on the first day that we arrived, we were able to find chairs & huts on the beach. (Some beaches/resorts we have visited in the past require you to arrive at the beach super early or even reserve a space the night before to guarantee a space for yourself, but this beach was spacious enough & had plenty of chairs!) The views on both sides of the hotel are awesome but there is nothing like waking up to see the ocean! I loved the view from our balcony. Lastly & perhaps my favorite aspect of this hotel: the executive lounge. For an extra cost, you can stay on an executive lounge floor which gives you access to the lounge on the top floor of the hotel. The lounge served breakfast each morning & hosted a happy hour each evening, along with having drinks & snacks available all day. It was so nice to wake up & go upstairs for breakfast & we LOVED the happy hour to grab a drink & snack before dinner. My parents made the reservations for this trip, so I'm not sure of the exact cost, but I highly recommend getting lounge access! To be honest, we didn't do much! This trip was a little shorter than our typical family trips so we really took advantage of the time we had to relax. The hotel offers non motorized sports equipment for rent (called Barbados Blue). My dad & sister rented boogie boards and enjoyed riding the waves. On our last full day, my dad and I ventured out in a kayak on the bay side of the hotel. The water on that side is much calmer and is perfect for kayaking, paddle boarding, jet skiing, etc. Last year when we kayaked, we were able to spot sea turtles swimming around but this year sadly, we didn't see any! If its your first time in Barbados, I would recommend visiting St Lawrence Gap. We ate in that area for dinner last year & it was really nice to walk around. I also wanted to visit Harrison's Cave - it sounded really amazing - but again, this trip was short so we chose sun & relaxation over adventure this time. Since we had visited Barbados already, we had a few favorite restaurants in mind that we wanted to visit. We ate at 'Tapas,' 'Buzo' & 'The Grill' for dinner during our trip. Tapas: Tapas is a gorgeous location right on the water - we had a great view of the sunset during dinner. We LOVED this restaurant last year & liked it again this year. My whole family agreed, the staff at hotels/restaurants makes a huge difference. When the wait staff goes above & beyond to make you feel welcome, it really betters the experience overall & our waiter this time around wasn't as animated as we remember the previous waiter. If you do decide to eat at Tapas, I would recommend trying something out of the box! Their menu includes foods like shark fritters & barracuda - when else can you eat that?! Buzo: I had remember Buzo being one of my favorite restaurants last year & it remains one of my favorites this year as well. Buzo is an Italian restaurant with gorgeous decor & the best bruschetta trio we've ever had! For dessert, we ordered a couple of flavors of sorbet and they arrive in the shell of their fruit! It was the coolest presentation! The pineapple sorbet was actually in a pineapple! The Grill: On our last night, we decided to try the hotel's restaurant, The Grill - a place we didn't eat the year prior. The service was a bit slow & bread cost extra but other than that, this restaurant was great & again, the decor & wait staff were lovely. Sometimes the hotel restaurants can be extra pricey but I thought this one was able equal in price to the other restaurants we ate at. - Everything that had a price next to it seemed SO expensive and I had to remind myself it was Barbadian dollars. A US dollar equals about 50% of 1 Barbados dollar. Have you vacationed in Barbados? What was your favorite part of your trip? Thank you for breaking it all down so well Michelle. Great suggestions will keep it in mind for my vacay to Barbados. All your outfits were all on point. That sweatshirt is super cute. Have a great weekend. So glad you found this post to be helpful! I'd love to go to Barbados! I'll keep your suggestions in mind in case I end up booking a trip there. It's an amazing location! Definitely worth considering for your next trip! You have amazing style. I absolutely love the beach dress. Beautiful pictures and that coverup with tassels in tow is to dye for!! !